The Meg delivers a fierce prehistoric bite without falling prey to campiness or gratuitous gore. The shark thriller has more science fiction elements than expected. Director John Turteltaub (Cool Runnings, National Treasure) has a story to tell with the monster hunt. This is both a positive and negative. The characters are fully fleshed out, but the narrative lulls with their excessive dialogue. Thankfully the bone chomping action kicks in on cue. The Meg isn't in the same league as Jaws, but far more sophisticated than The Shallows and the god-awful 47 Meters Down. The Meg opens on the Manta One, a futuristic research station at sea. A billionaire (Rainn Wilson) is visiting his pet project to observe a groundbreaking expedition. Scientists (Li Bingbing, Winston Chao) have discovered a hidden world under the ocean floor. Their exuberant exploration quickly turns to horror. A gigantic creature has attacked and trapped their submersible. The extreme depth of the rescue is unparalleled. Only one man, Jonas Taylor (Jason Statham), has the experience needed to lead the team. But he is haunted by a similar event that ended tragically. The Meg reveals the shark like a simmering boil. As the plot heats up, we gradually get more of the nasty beast. Then it's all out carnage to the big climax. The Meg doesn't give up the goods too early, but smartly shifts into high gear once we ascertain just how big the shark is. John Turteltaub succeeds in crafting the rising action. This is key to audience engagement, especially if you're not relying on extreme violence. 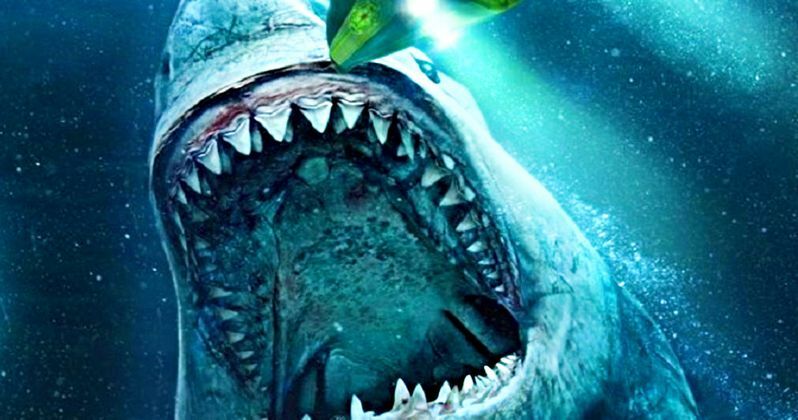 The Meg slickly gets its shark on while staying firmly in the PG-13 sphere. The supporting cast has an overabundance of screen time. Jason Statham is the lead, but the ensemble characters yap it up throughout. There are several subplots that detract from the tension. I could have done without any of it, but understand the reasoning. The Meg is an American-Chinese production between Warner Bros. and Gravity Pictures. The setting, cast members, and several subtitled scenes are tailored to the Asian audience. I'm all for cinematic globalization and equity, but not at the expense of the story. This criticism is actually aimed towards a couple of the English speaking characters. One in particular, meant to be the comic relief, gets old very quickly. The Meg could have been leaner and darker with these characters removed completely. The shark effects are solid across the board, but I did have some issues with the CGI water displacement. There are a few shots where the water effects looked digital, particularly when the shark's dorsal fin is cutting through the water. This is difficult to avoid when the film takes place entirely in water. But my discerning eye wants seamless morphing and compositing. I don't want to be looking at a video game in my big-budget shark movie. The Meg largely removes the cheese factor of the genre, but still remains a fun popcorn flick. The shark, despite being an enormous creature from the Pliocene era, behaves like an actual shark. The characters deal with it as such, adding a dose of realism to the fantasy. Look out for a clever Finding Nemo Easter egg.